GIANTS OF THE ART WORLD : Paso Robles Art Association presents the Magnum Masterpieces Invitational Art Show and Fundraiser taking place March 31-April 20. Make a bid (a raffle is also happening) online or in a silent auction, or snap up creations at the “Buy it now price.” Proceeds will be used to establish and equip a new facility, The Showroom Gallery, located in downtown Paso Robles. 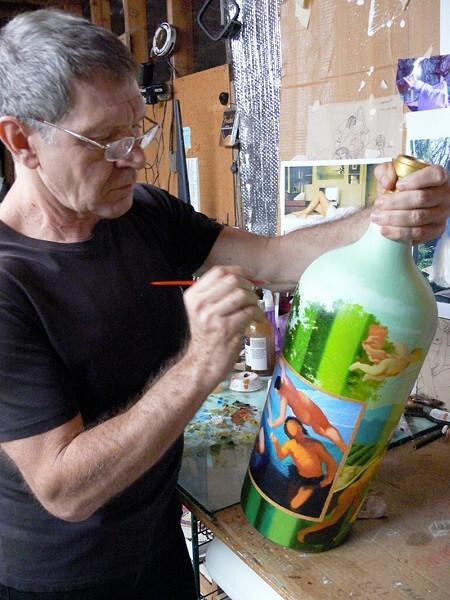 The show features 30 Imperial size (6- liter) wine bottles hand painted by some of the area’s most collected artists, including Frank Licsko who is pictured (using oil paints). Area wineries, hotels, restaurants and many retail locations are participating. From April 23-May 24 works will be featured at The Showroom Gallery (on Pine Street, across from City Park). Info: 238-5473 or pasoroblesarts.org. New Times For people who don’t know, tell me a bit about yourselves. Joanne Licsko We have lived on the Central Coast since 1989, and in San Miguel for almost five years. New Times Where did your art careers begin? Joanne In Canada, but Frank would probably say Europe since he’s from Budapest, Hungary. Frank Licsko I’m one of the perfect ones [laughs in a thick Hungarian accent]. In Europe they feel they’re perfect. New Times You have been doing art for many years, but what are you most known for? And what are you working on now? Frank I’ve gone through many phases, as I’ve been painting for over 50 years. A recognizable Licsko would be a surrealist landscape where I would paint things like the sea inside a big seashell, and as I became more mature I realized I was creating a new art with a high degree of precision. In the mid ’70s-’80s we were living in an age where science ruled everything, and religion no longer ruled the world ... so I wanted to see what happened if I mixed art with science, rather than religion. I also do something called “Ether Realism”—I treat the landscape like a flag, where everything rolls like a flag would, including the horizon line. Now I am going to work on more figurative work. New Times How did you get involved with the Magnum Masterpieces Invitational Art Show and Fundraiser? Frank It’s completely my wife’s fault, maybe she should tell you. Joanne The Paso Robles Art Association, which Frank and I are both members of, asked for volunteers to raise money for the new gallery within the Studios on the Park. The PRAA will maintain a permanent gallery presence in that building. And the money raised from the magnums goes toward the gallery. Our committee came up with idea of paying tribute to the number one industry in this area, which is wine. We are doing empty bottles though. It is an invitational art exhibit. Frank We are using the bottles as a canvas. New Times What did you paint on your bottles, Frank? Frank Bacchus, the Roman god of wine, called Dionysus by the Greeks, and Ariadne, who is best known as the daughter of the Minataur who aided Theseus’ escape from the labyrinth using a string. After Theseus died, Venus consoled her by giving her an immortal lover, Bacchus. One of the scenes I painted on the magnum is from Tintoretto’s painting, which shows Bacchus giving her a crown of stars as his wedding gift. Basically the god of wine and the god of art and culture. Joanne He has combined two existing classical works of art onto his bottle and added his own things … the rolling vineyards in the background. We have 27 bottles done by well known artists: Steve Kalar, Anne Laddon, Michael Ackerman, Frank Armitage, and Carol Timson Ball and Jesus Solorio … to name a few. These bottles take a lot more work than anyone expected. They’re big. Frank has been working on his since October. Frank The artistic community is responding to the wine industry. Art and wine go hand in hand, that’s why people go to Rome and Paris, for the wine and food, and for the culture. Studios on the Park is going to benefit the city. The art will be concentrated, like in a theater atmosphere, where people can go and see the art being created, and interact with the artists. New Times And you will be one of those artists, Frank? Frank Yes, because I want to see the community grow.